While we are busy arguing about Nawaz Sharif, Tahir ul Qadri and Imran Khan, on this very great day 67 years ago Quaid-e-Azam layed the foundation of a system that was his dream, A Pakistanis dream, Allama Iqbal’s Poetry, Sir Syed Ahmad Khan’s Vision. I Pray and hope that in time we realize it’s not about Pakistan Tehreek Insaf, Pakistan Muslim League, Pakistan Awami Tehreeq or any party for that matter, it’s about Pakistan. If these parties divide us, than there is no point in having them. I cordially thank you, with the utmost sincerity, for the honour you have conferred upon me – the greatest honour that is possible to confer – by electing me as your first President. I also thank those leaders who have spoken in appreciation of my services and their personal references to me. I sincerely hope that with your support and your co-operation we shall make this Constituent Assembly an example to the world. The Constituent Assembly has got two main functions to perform. The first is the very onerous and responsible task of framing the future constitution of Pakistan and the second of functioning as a full and complete sovereign body as the Federal Legislature of Pakistan. We have to do the best we can in adopting a provisional constitution for the Federal Legislature of Pakistan. You know really that not only we ourselves are wondering but, I think, the whole world is wondering at this unprecedented cyclonic revolution which has brought about the clan of creating and establishing two independent sovereign Dominions in this sub-continent. As it is, it has been unprecedented; there is no parallel in the history of the world. This mighty sub-continent with all kinds of inhabitants has been brought under a plan which is titanic, unknown, unparalleled. And what is very important with regards to it is that we have achieved it peacefully and by means of an evolution of the greatest possible character. I know there are people who do not quite agree with the division of India and the partition of the Punjab and Bengal. Much has been said against it, but now that it has been accepted, it is the duty of everyone of us to loyally abide by it and honourably act according to the agreement which is now final and binding on all. But you must remember, as I have said, that this mighty revolution that has taken place is unprecedented. One can quite understand the feeling that exists between the two communities wherever one community is in majority and the other is in minority. But the question is, whether it was possible or practicable to act otherwise than what has been done, A division had to take place. On both sides, in Hindustan and Pakistan, there are sections of people who may not agree with it, who may not like it, but in my judgement there was no other solution and I am sure future history will record is verdict in favour of it. And what is more, it will be proved by actual experience as we go on that was the only solution of India’s constitutional problem. Any idea of a united India could never have worked and in my judgement it would have led us to terrific disaster. Maybe that view is correct; maybe it is not; that remains to be seen. All the same, in this division it was impossible to avoid the question of minorities being in one Dominion or the other. Now that was unavoidable. There is no other solution. Now what shall we do? Now, if we want to make this great State of Pakistan happy and prosperous, we should wholly and solely concentrate on the well-being of the people, and especially of the masses and the poor. If you will work in co-operation, forgetting the past, burying the hatchet, you are bound to succeed. If you change your past and work together in a spirit that everyone of you, no matter to what community he belongs, no matter what relations he had with you in the past, no matter what is his colour, caste or creed, is first, second and last a citizen of this State with equal rights, privileges, and obligations, there will be on end to the progress you will make. 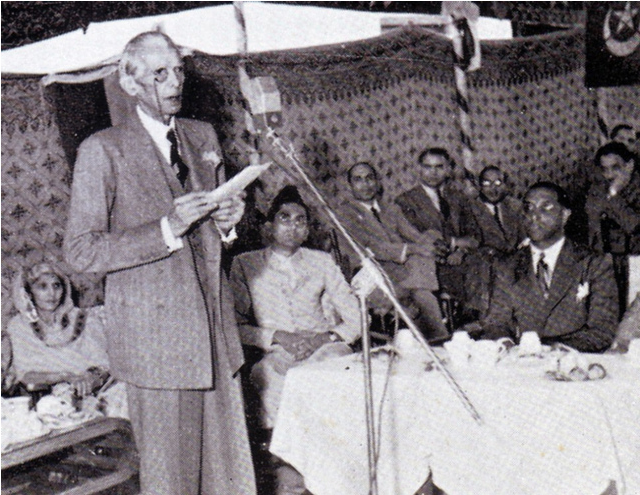 Quaid-e-Azam was a true leader, a man of the people..